Fatgirl Hedonist: BYOB Brunch For A Good Cause! BYOB Brunch For A Good Cause! 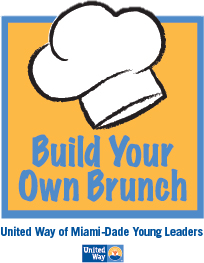 On Saturday, September 20, 2014, United Way of Miami-Dade Young Leaders will host an interactive cooking and eating experience, “Build Your Own Brunch” B.Y.O.B. Guests will spend the afternoon preparing a three-course brunch, under the tutelage of some of Miami’s most popular chefs, Timon Balloo of Sugarcane Raw Bar Grill and Bocce Bar, Antonio Bachour of St. Regis Bal Harbour and Makoto Okuwa of Makoto. Aside from the food, Titos Vodka cocktails will be available, and for all the craft beer nerds, Wynwood Brewing Company will have the best fit brew on tap. This is all happening on September 20, 2014 at 11:00am - 2:00pm in the Intercontinental Hotel, located at 100 Chopin Plaza, Miami Fl, 33130. Prices for the general public are $100 per person and $75 for young leaders. The chefs that are lined up to participate are some of the best Miami has to offer. The opportunity to engage in an interactive dinner with them is one not to be missed. This will be a fun event and a great idea for a date with a significant other, so be sure to get your tickets here!! !